I have a development Ubuntu Server (12.04.1) VM that I use to develop php sites and e-commerce sites (like Magento etc). Because this is for development purposes, and I need to test with e-mail addresses other than my own, I need a way for the sendmail command to accept a mail but not actually deliver it, but rather archive is somewhere where I can look at it. What is the easiest way to install a mail server such that the sendmail command routes ALL mail to a local directory? i.e. I do NOT want any mail to be delivered to the internet. This will deliver ALL mail that postfix handles to the configured local user defined in #1, so don't use this for anything other than development. "Because this is for development purposes, and I need to test with e-mail addresses other than my own, I need a way for the sendmail command to accept a mail but not actually deliver it, but rather archive is somewhere where I can look at it." You'll still need to deliver it. You just need to override "where" it's delivered. "What is the easiest way to install a mail server such that the sendmail command routes ALL mail to a local directory? i.e. I do NOT want any mail to be delivered to the internet." This can actually be done using only the default postfix installation package (no need for postfix-pcre). 3.) Run the following command to create the correct database file for postfix to look-up this new "virtual alias map". The new, autogenerated database file will be called "virtual.db"
Now all mail, regardless of the sender, recipient or program that points to this SMTP server, will be delivered locally to the specified user. There are numerous options to read / retrieve these messages now. If you install an IMAP or POP3 courrier (such as dovecot), you can use a Mail User Agent (Thunderbird, Outlook, etc.) to connect to your local mailbox and read the messages. See another cool approach here How to catch emails sent with PHP on your local server. Add sendmail_path = /usr/local/bin/sendmail to /etc/php5/apache2/php.ini. Now all your mails are in /var/log/mail folder. 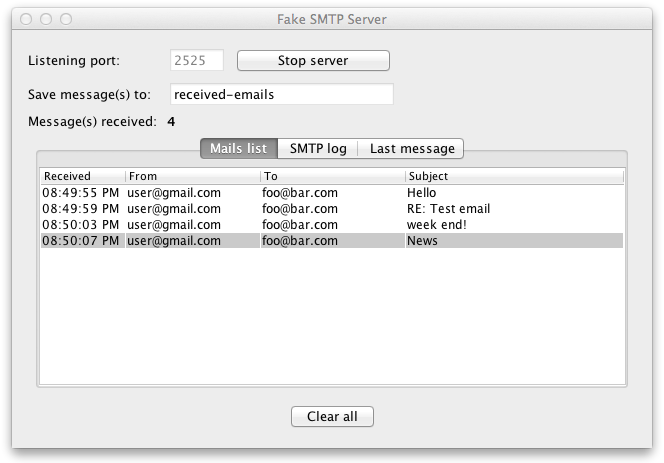 Another approach is to run a "FakeSMTP" server, a cross platform SMTP handler; who's whole purpose is to receive emails, store and display them with your configured email client. Not the answer you're looking for? Browse other questions tagged postfix localhost sendmail or ask your own question. sendmail and local mail server?